February is the month of love. Celebrate at Buckhorn this month and relax, letting us take care of all the pesky details. Reserve online ( www.buckhorninn.com) or telephone toll-free 866-941-0460. This celebration of the American West features cowboy singers, musicians and poets. 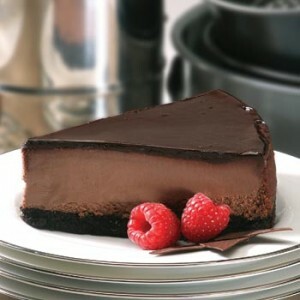 The sweetness of this cheesecake recipe checks in at just the right level to let the chocolate flavor stand out. Press cookie crumbs into bottom and halfway up sides of a 9-inch springform pan; set aside. Microwave chocolate morsels in a microwave-safe bowl at HIGH 1 1/2 minutes or until melted, stirring at 30-second intervals. Beat cream cheese at medium speed with an electric mixer 2 minutes or until smooth. Add sweetened condensed milk and vanilla, beating at low speed just until combined. Add eggs, 1 at a time, beating at low speed just until combined after each addition. Add melted chocolate, beating just until combined. Pour cheesecake batter into prepared crust. Bake at 300° for 1 hour and 5 minutes or just until center is set. Turn oven off. Let cheesecake stand in oven 30 minutes with oven door closed. Remove cheesecake from oven; run a knife along outer edge of cheesecake, and cool in pan on a wire rack until room temperature. Cover and chill 8 hours. Remove sides of springform pan, and place cake on a serving plate. Slowly pour and spread warm Ganache Topping over top of cheesecake, letting it run down sides of cheesecake. Chill 1 hour before serving. Bring cream to a boil in a saucepan over medium heat; quickly remove from heat, and stir in semisweet and milk chocolate morsels until melted and smooth. Let mixture cool (about 30 minutes) until slightly warm before pouring and spreading over cheesecake.